Stunning modern loft in the highly sought after Liberty Market Lofts. 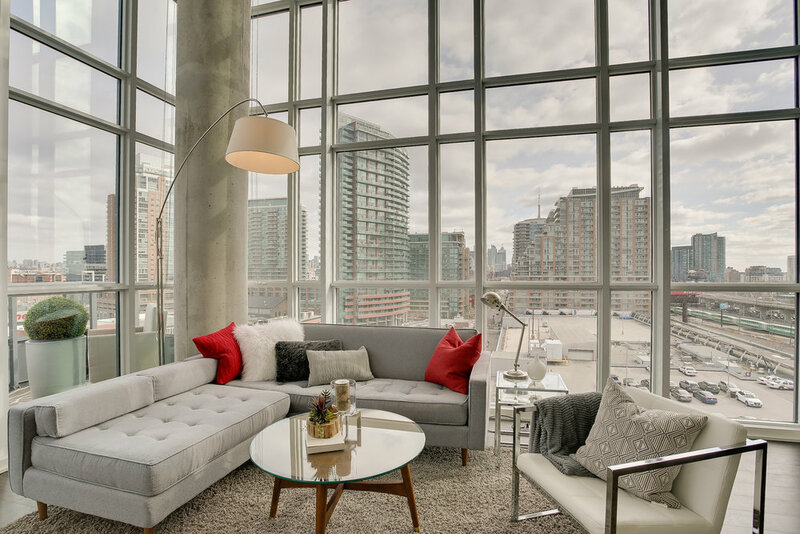 This bright and spacious corner suite offers approximately 900 square feet of space with an additional 80 square foot balcony and boasts 17 foot, floor-to-ceiling, wall-to-wall windows with beautiful views of downtown Toronto, Liberty Village and Lake Ontario! This open concept unit features an engineered hardwood floor throughout the main level, beautiful glass and steel railings, eat-in kitchen with large centre island, integrated appliances, and two sets of custom-made semi-transparent and blackout curtains. The master bedroom overlooks the living room and features a large walk-in closet and 4 piece ensuite. Located in the heart of Liberty Village this amazing building has first class amenities and is surrounded by shops, restaurants, and cafes. Commuting is a breeze with both the Exhibition GO & TTC King Streetcar just a 3 or 6 minute walk from your front door!